It’s here! 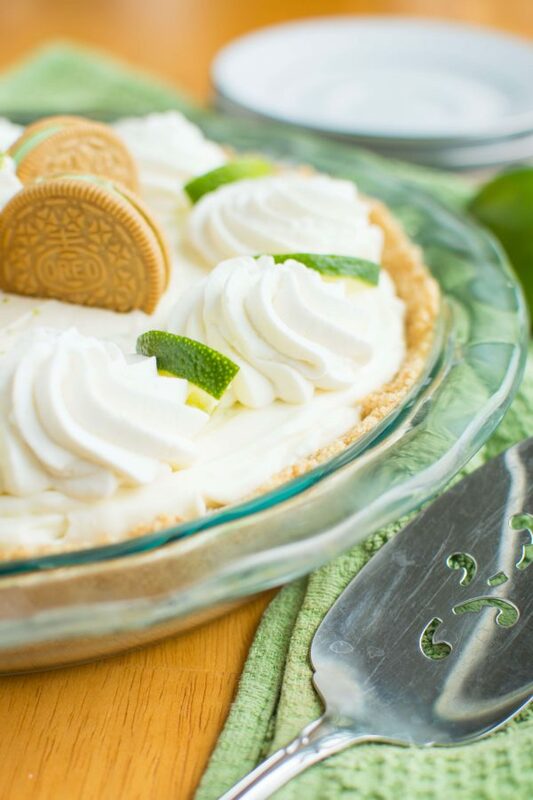 Key Lime Oreo Truffle Cream Pie. 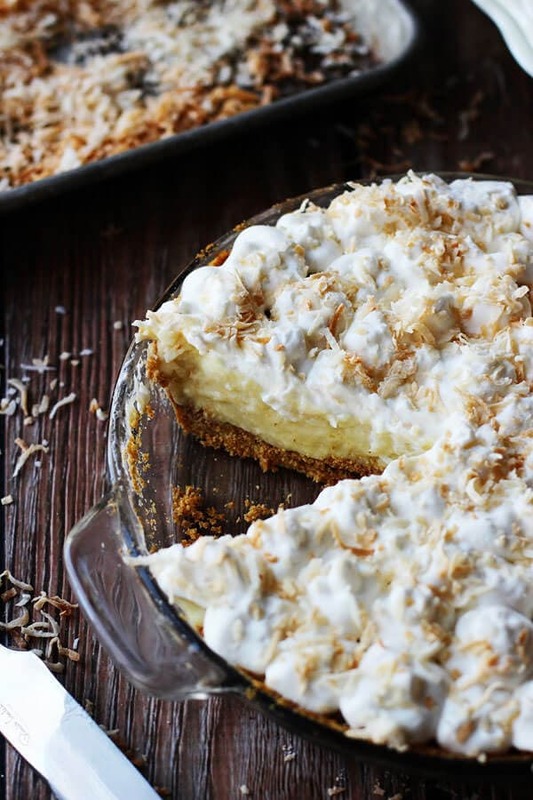 A no-bake pie that starts with a graham cracker crust filled with a layer of rich Key Lime Oreo truffle filling and a layer of tangy white chocolatey mousse filling! 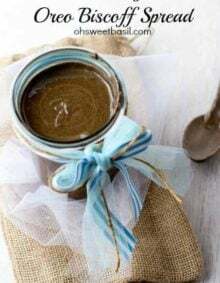 Hey everyone, Jillian here from A baJillian Recipes and I’m back to share another recipe of mine with every single one of you beautiful foodie lovers out there! 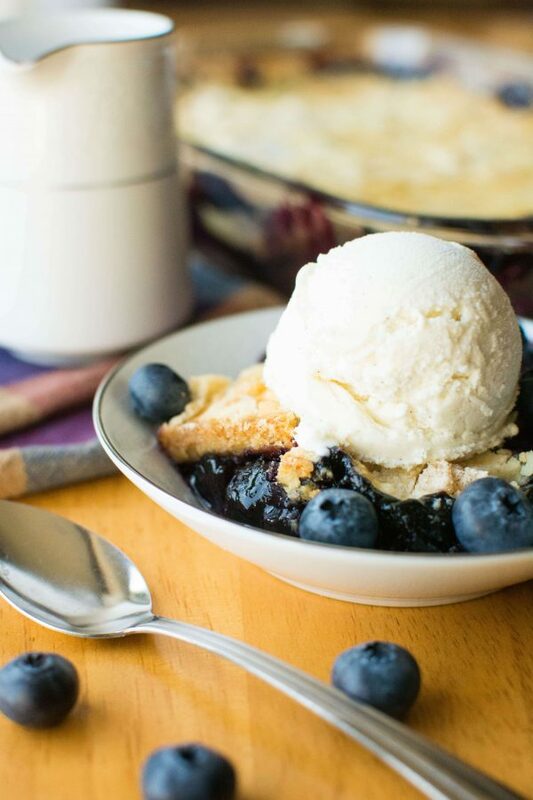 With summer quickly approaching, I figured it was time to whip out this wonderfully citrusy and sweet dessert that I’ve been absolutely dying to share. 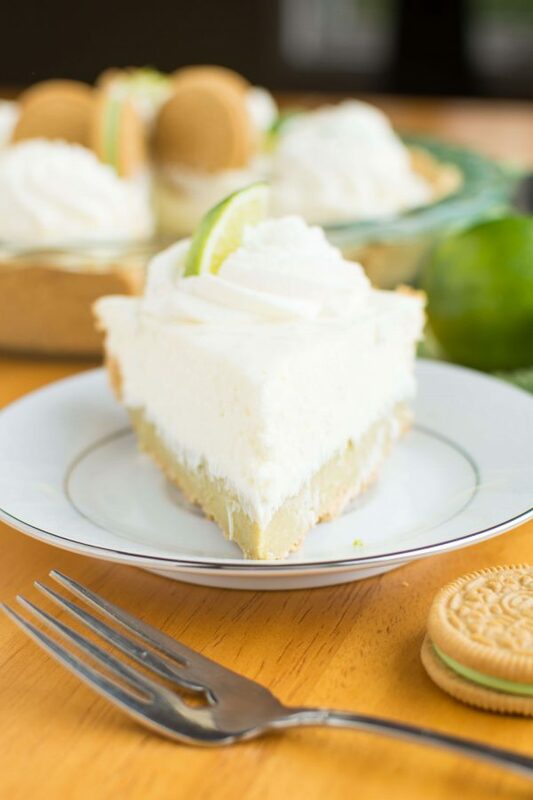 Seriously guys, this idea has been on my dessert to-do list in my phone for what seems like FOREVER now, so I’m ecstatic to finally get to reveal this Key Lime Oreo Truffle Cream Pie! 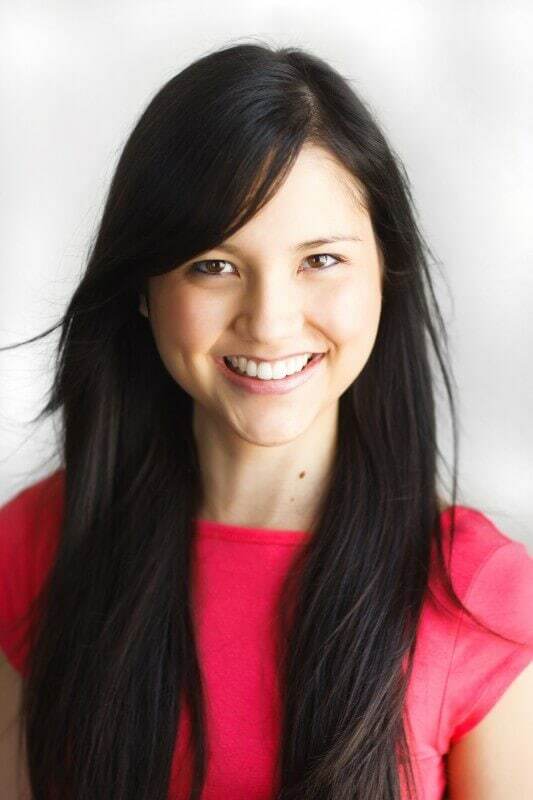 Now, if you haven’t been to my blog yet (shame on you! ), you should know that I LOVE Oreos. It’s almost pathetic how extremely excited I get every time I discover a new flavor in the store. 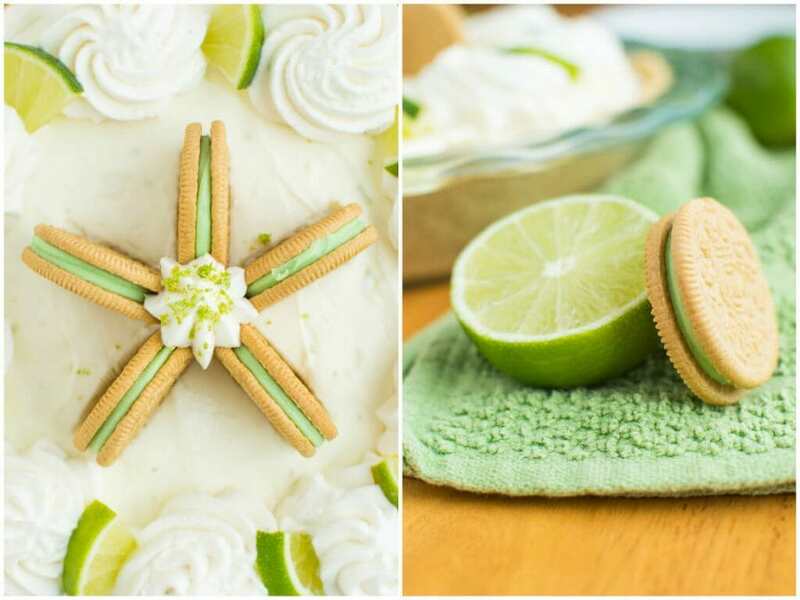 So when I came across the Key Lime Pie Oreos, I lost it. 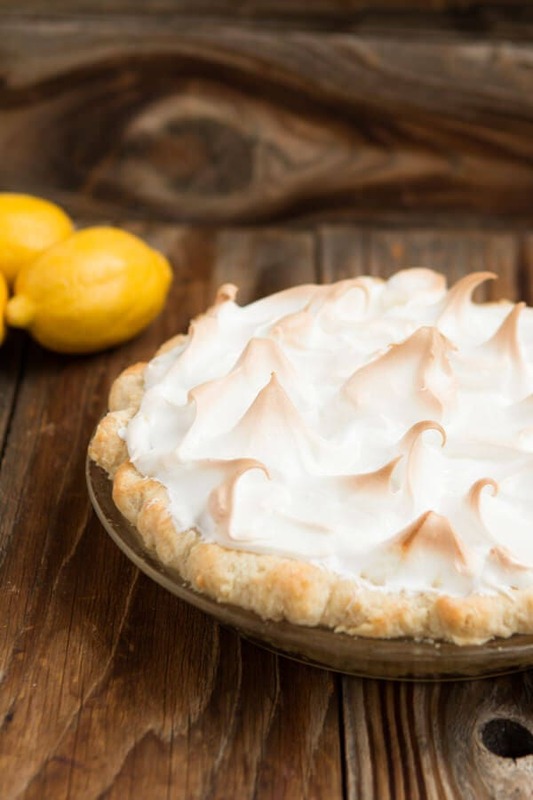 With the delicious success of my Oreo Truffle Cream Pie and my Red Velvet Oreo Truffle Cream Pie, I just knew it was time to add a key lime version to my repertoire. 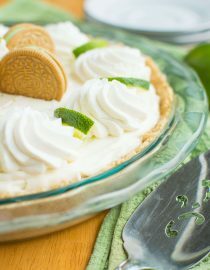 Plus, it only makes sense to create a pie with Key Lime PIE Oreos, right? 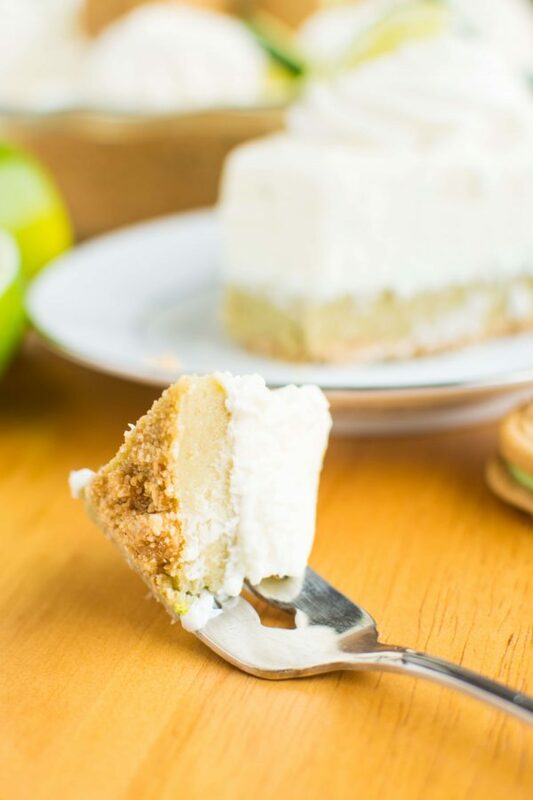 Just like every classic key lime pie, this one starts out with a simple graham cracker crust. As someone who’s terrible at making dough pie crusts (my mom’s the pie-baker in the family), graham cracker crusts are definitely my saving grace. All I have to do is crush up some graham crackers, stir in a little sugar and melted butter, then press it into a pie pan. Done! Next comes the GOOD part…the thick layer of Key Lime Oreo truffle filling. 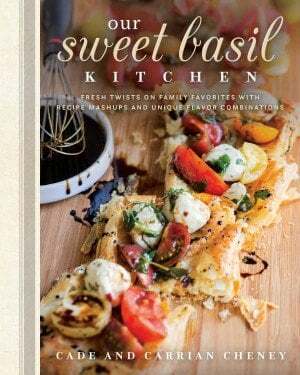 So sweet, so velvety, and only two ingredients! Seriously! All you have to do is place the Oreos and cream cheese in a food processor and pulse until completely smooth. The only difficult part is spreading ALL of it into the crust without sneaking in a “few” tastes. The next layer is the lightest, tangiest, white chocolatey mousse filling. As someone who’s completely addicted to white chocolate (it’s totally my bff), this filling has become my new replacement for a boyfriend. White chocolate pretty much pairs well with anything, but when you combine it with the citrusy sweetness of fresh limes, your whole world will change. Well, maybe I’m being a little melodramatic…but still, this filling is perfect in every way. 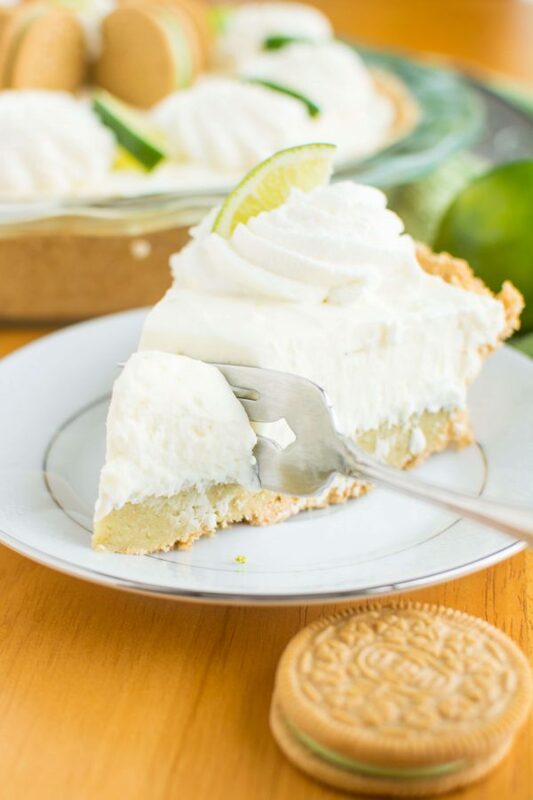 So smooth…so rich…so fluffy…and flavored with just the right amount of fresh lime juice and zest to push this pie over the top. 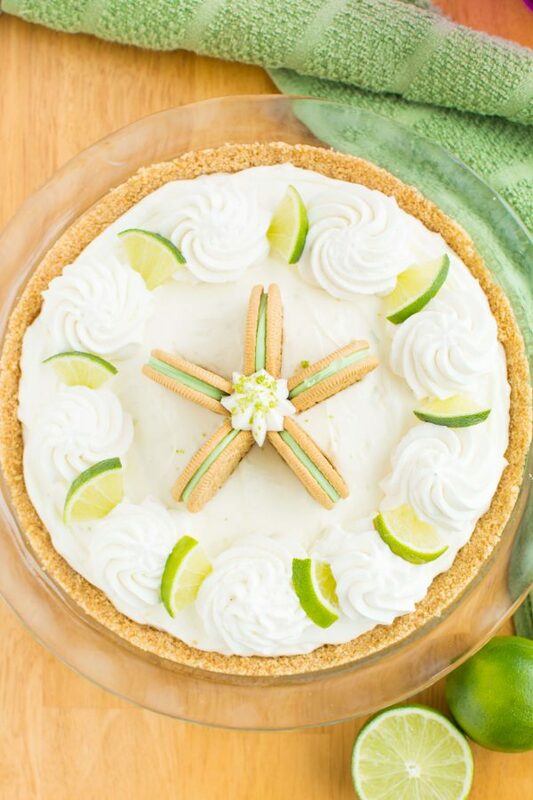 Feel free to prettify this beautiful pie with some extra whipped cream and a few fresh lime slices before serving. However, if you’re not quite the Martha Stewart type, no worries. It’ll taste JUST as heavenly! Can Graham Cracker Crust be Frozen? Baked and unbaked graham cracker crusts can be frozen and used later. Wrap tightly in plastic or place in a freezer bag and freeze. 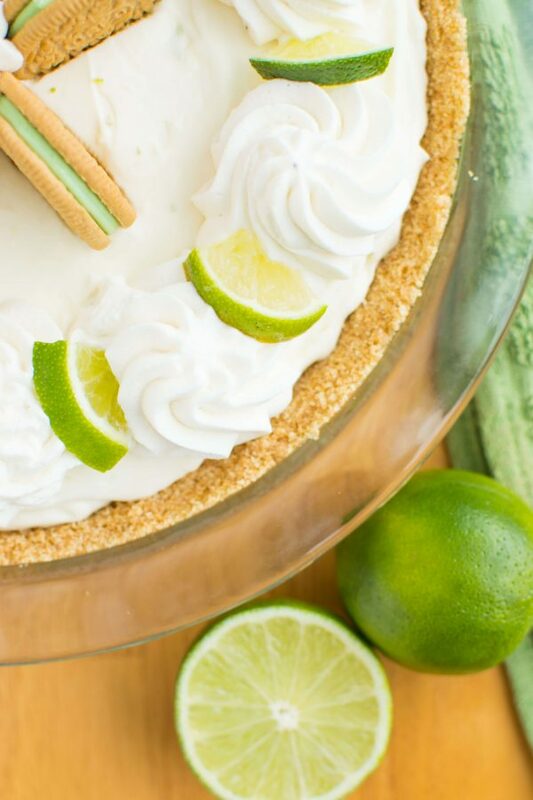 Can Fresh Key Lime Pie be Frozen? Wrap tightly in foil or place in heavy duty freezer bag. 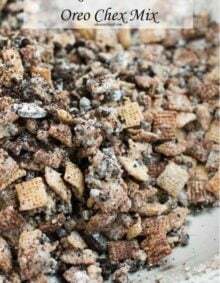 In a large mixing bowl, use a fork to combine the crushed graham crackers, sugar, and melted butter. 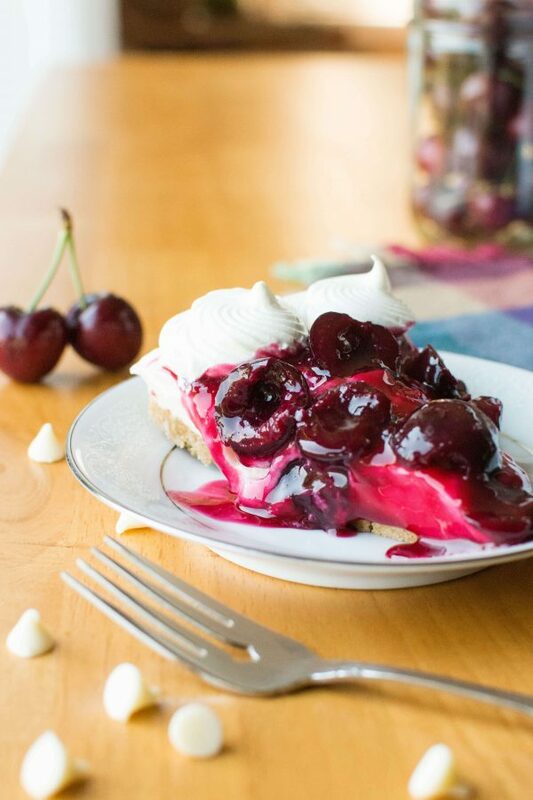 Press mixture into the bottom and up the sides of a 9-inch pie plate*. Refrigerate crust while you work on the truffle layer. In a food processor, pulse 18 of the Key Lime Oreos until broken into fine crumbs. Add the 4 ounces of cream cheese and continue pulsing until well blended. Spread truffle mixture evenly into the crust. Melt white chocolate in the microwave until smooth. Allow to cool slightly. Gradually add powdered sugar and continue whipping until stiff peaks form. Transfer whipped cream to another bowl and place in refrigerator to keep chilled. Beat the 8 ounces of cream cheese until smooth. Add melted white chocolate and continue beating. Add lime zest and juice. Remove bowl from the mixer and fold in 1/2 – 2/3 of the whipped cream. Pour filling over the truffle layer, smoothing out the top. 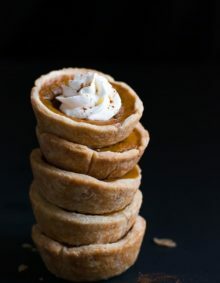 Transfer the reserved whipped cream to a pastry bag or small ziploc bag with the tip cut off, and decorate the pie as desired. Garnish with the remaining Oreos. (Or just eat them!) Refrigerate for at least 4 hours before serving. *I used a 9.5-inch pie plate.